Caitlin and Bobby found us through our website, as most couples do these days and came to see us at a live showcase last summer before booking us for their wedding. 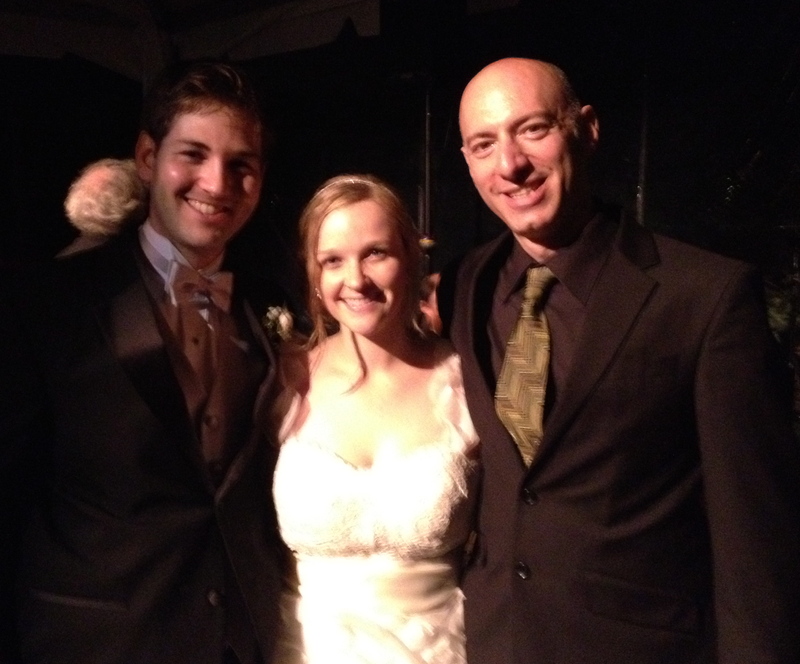 A lovely couple, they chose mostly retro music for their reception which took place at Caitlin’s grandmother’s house on a small satellite facility of her horse farm in Waccabuc, NY a beautiful hamlet in Westchester County. 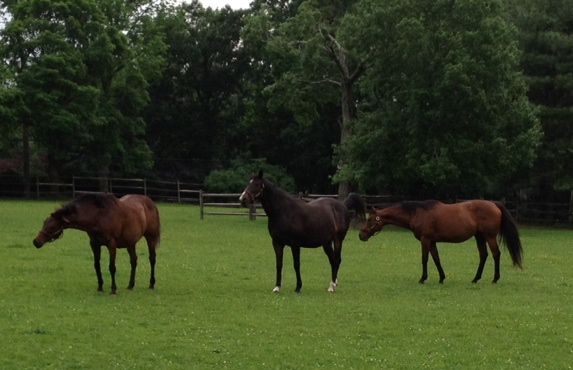 The Waccabuc branch of Edition Farm is home to three gorgeous retired mares who were out for an afternoon of grazing as the guests arrived. 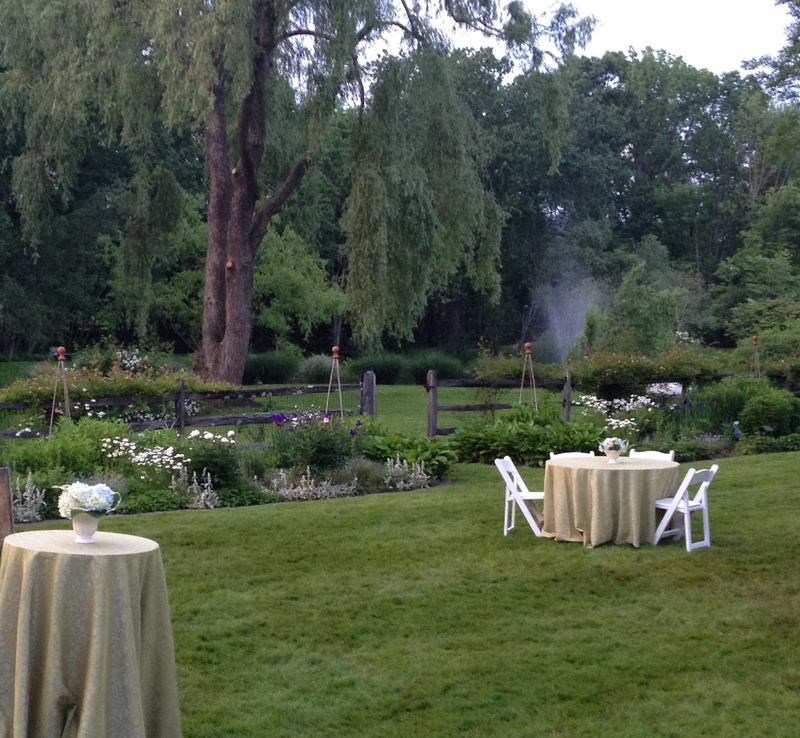 Luckily, this was after a few light showers had passed over, once again clearing the way to a rain free outdoor reception – which happens a lot for us! 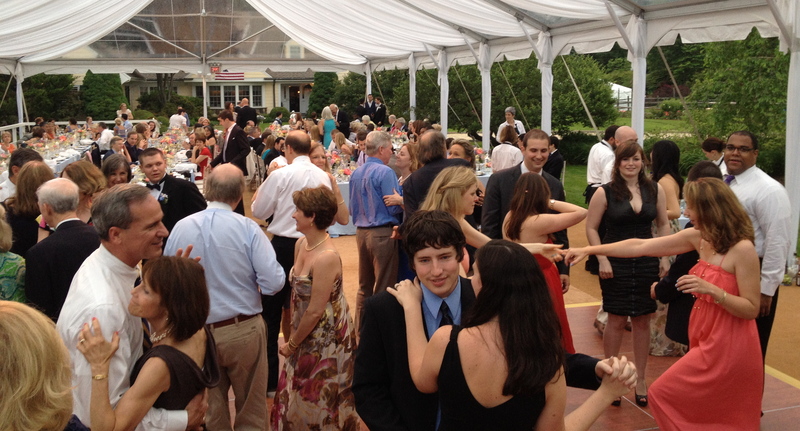 The ceremony took place in a local church, so guests arrived at the farm in time for cocktails behind the main house next to the pool. Guests were led down a stone path through an arbor to the back yard where they found a very unique way to determine their table assignments. 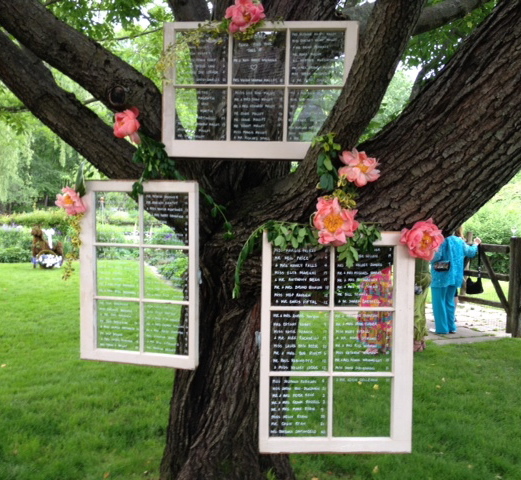 The names of the guests, along with their seating placement, were written in white on the glass of some vintage window panes that were hung from a giant old maple that sat majestically at the entrance to the yard. This was such an adorable touch, we just had to snap a pic! 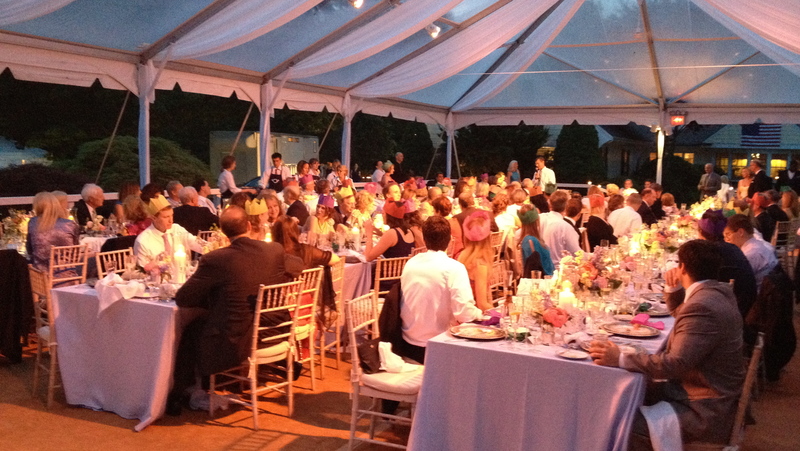 The reception tent was set up in front of the house near the paddocks where the horses were allowed to graze and exercise. 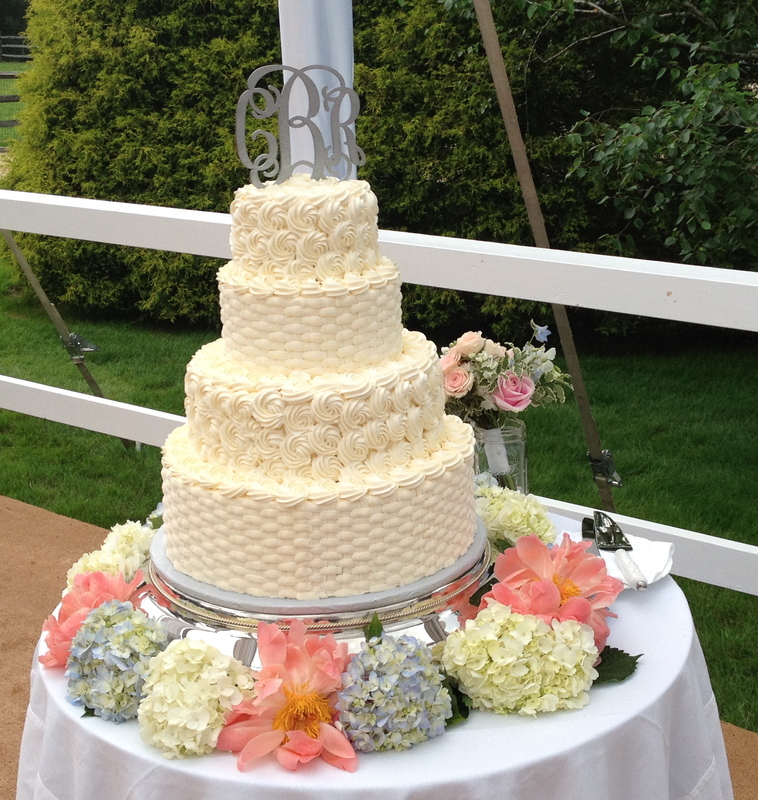 The seating was done family style and the table settings were immaculate! 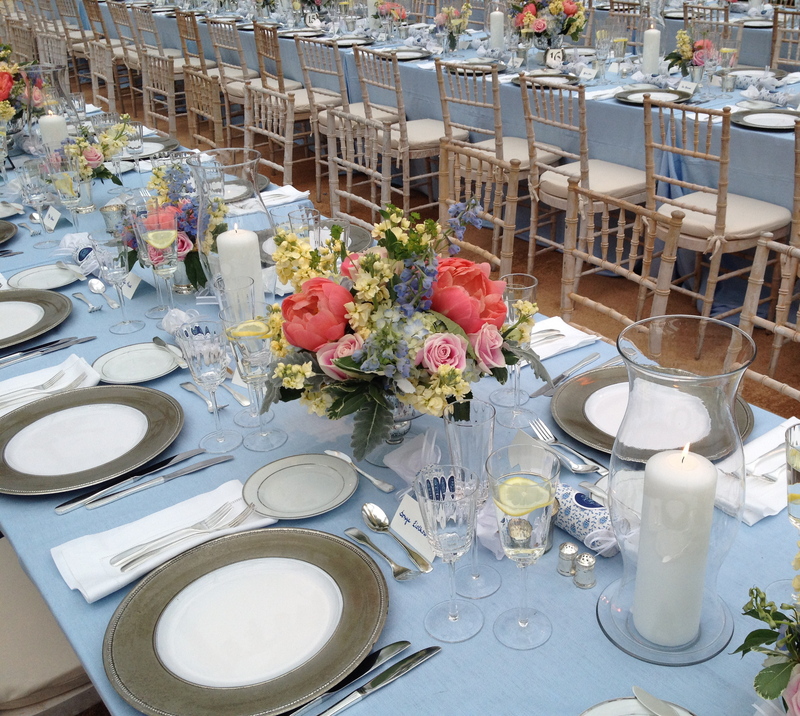 A mix of peonies, hydrangea, roses and wildflowers adorned the tables with silver rimmed chargers and light blue table cloths. The whole of the decor reflected the essence of spring. 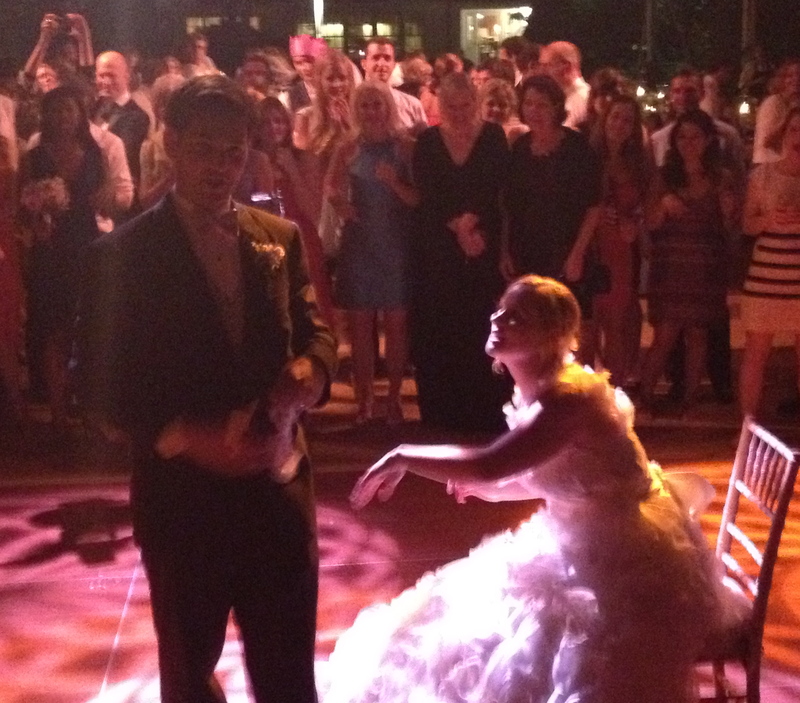 The guests were instantly enchanted. Elaina of Elaina Events Etc. did an amazing job! 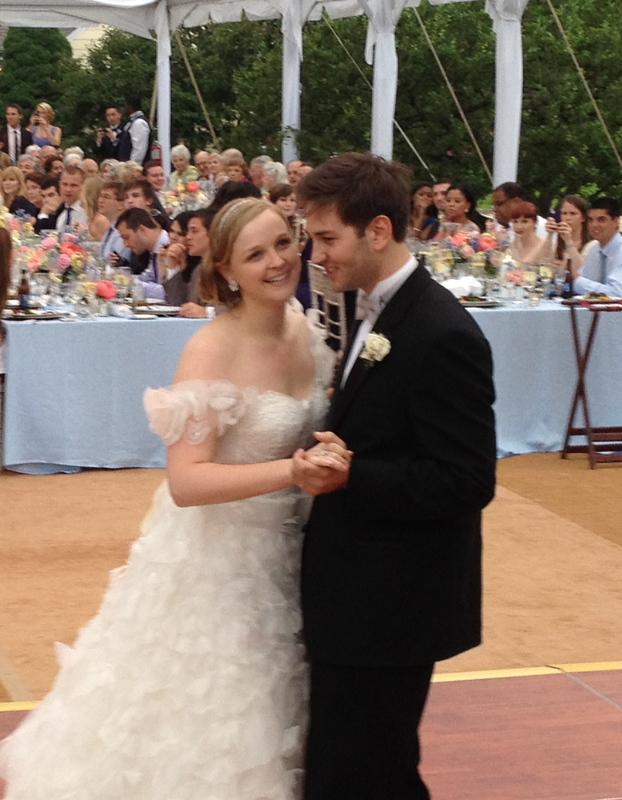 The reception began with Caitlin and Bobby’s first dance, The Beatles classic In My Life. We then went right into a dance set of Motown and R&B favorites like Signed Sealed Delivered, Everyday People and Let’s Stay Together. The crowd was up on their feet immediately and we knew we were going to have a great time with great dancers! A little later on, we got to some more contemporary selections by request from the crowd and ended up playing a little something for everyone, from Donna Summer to Carole King. Caitlin danced with her dad to You Are the Sunshine of My Life by Stevie Wonder and Bobby shared a dance with his mom to Unforgettable, by the legendary Nat King Cole. It was truly a wonderful evening, at the end of the night, Caitlin’s grandmother shook my hand and told me what a fabulous time she’d had “your music made the whole evening” she said. Thank You so much for the kind words and for allowing us to share in your most very special day, oh and we can’t wait to hear all about Caitlin and Bobby’s honeymoon in Turkey! Nite-Time Kicks Off Summer at The Octagon NYC! Purpose: To open the pool and kick start the season! It was a gorgeous Saturday afternoon that came on the heels of about two straight weeks of rain in NYC (at least it felt that way). 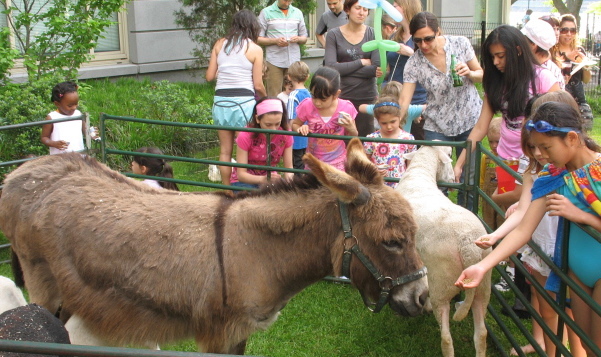 The good folks at The Octagon on Roosevelt Island took a chance on the weather and threw a huge shindig to get the summer season started with a bang. Luckily, the blue skies held on long enough to really make it a bash. With a scaled down version of Nite-Time in tow, Yves and I headed to the island. Believe it or not, in all my years in NYC, I’d never ventured to Roosevelt Island. I’m ready to move in! 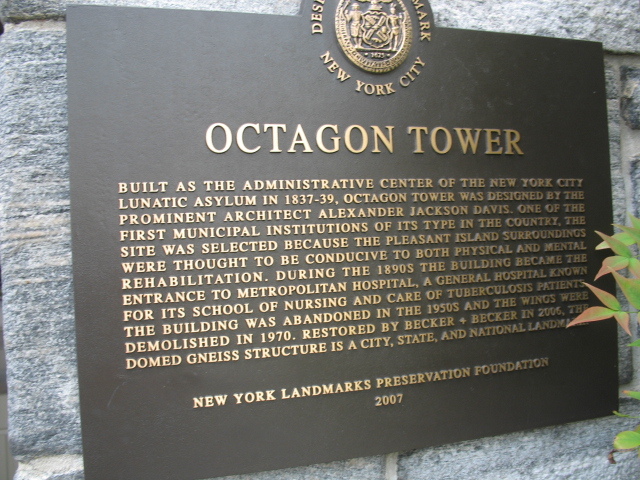 The Octagon NYC is on the northern part of the island. 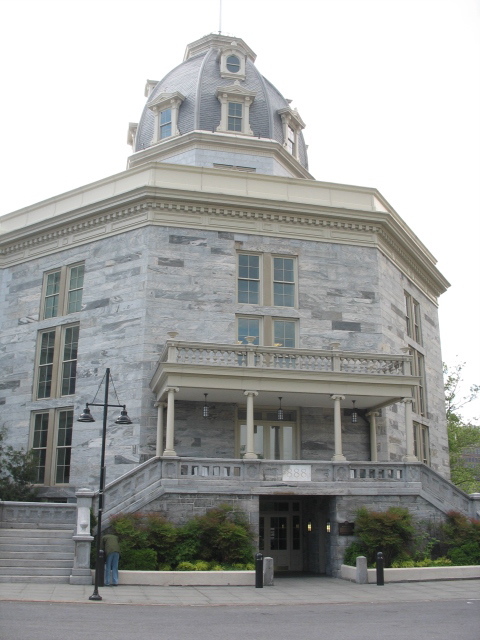 It was built onto the Octagon Tower, which began construction in 1837 and completed in 1839 to be the main administrative building of the lunatic asylum that was housed on Roosevelt Island in the 1800’s because “the pleasant island surroundings were thought to be conducive to both physical and mental rehabilitation”. The building is full service and so was the party. They had an amazing spread of food, sangria, beer and soda. 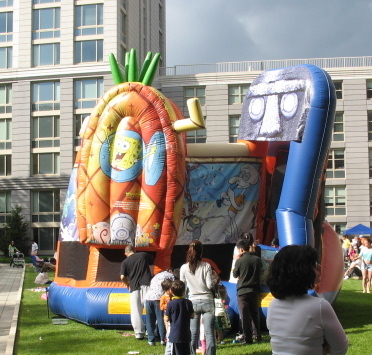 A cotton candy machine and snow cones for the kids and, of course what summer spectacular would be complete without a giant bounce house and petting zoo? So, back to the music. On the opposite side of the courtyard we could be heard rocking out to Motown, Classic Rock, R&B and Soul. We had to throw a bit of Jimmy Buffet in as well, just to fit the summer jam theme! We had a great time and can’t wait to party with the folks at The Octagon NYC again. And hey, if you’re looking for a place… you should totally check them out. They throw one hell of a party!! A Thank You Note from Josephine. Thank you soooo much for Saturday night! The band really was amazing and you left a wonderful impression on everyone there. People were shocked how great you guys sounded and especially the birthday girl was in heaven. You really are an outstanding band! I hope to encounter you once again, but I’ll definitely be referring you to everyone I know. I hope you enjoyed yourself as well.